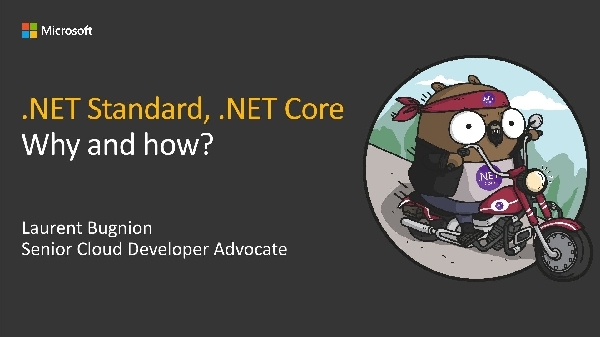 .NET Standard is the new way to create portable assemblies. After learning about portable class libraries in the past years, it is now time to upgrade our game and start coding for Linux, Mac OS and other platforms in addition to Windows. More and more libraries are getting ported to .NET Standard, sometimes really easily and sometimes more painfully. In this session, Laurent Bugnion, the creator of the popular open source MVVM Light Toolkit, will help you understand why .NET Standard can benefit you. We'll talk about ASP.NET Core, see how easily we can containerize and deploy our web applications to Linux on Azure. Finally Laurent will also talk about his experiences converting his open source framework to .NET Standard. I am really happy to be for the very first time in Brazil. On the 11th and the 12th, I will be speaking about Azure data and migration of databases to Azure. Adding a meetup to this trip makes me really happy, as this is the occasion to meet even more developers in a smaller setting. I hope that I will see a lot of developers at this occasion!! Make sure to check all the details from the Meetup site.